The Lower Platte River Corridor Alliance, in partnership with the Nebraska Game and Parks Commission and National Park Service hosted a series of public meetings to discuss opportunities for the expansion of recreational opportunities and the development of a Platte River Water Trail. The three public informational meetings regarding the Lower Platte River Recreation plan began in March. The first meeting was Tuesday, March 22nd at the Ashland Community Center. Fifty-six people participated in the meeting from Ashland and represented a diverse set of affiliations, backgrounds and locations. A welcome was given by the Mayor of Ashland and was followed by three additional welcomes from a local outfitter and owner of Platte River Rentals, a director of the Nebraska Airboat Association, and a resident of the community. The LPRCA presented a brief overview of the recreation plan with Craig Wacker of NGPC and we were followed by David Thomson and Holly Greismer of the National Park Service who presented an overview of water trails in other states within the region and national trends in outdoor recreation. The remainder of the meeting was then spent in small group discussions. Each group discussed “opportunities”, “constraints” and then “free ideas”—or things we had not yet discussed, captured or they thought were key for their community, the river or recreation. The same format was utilized at both the Fremont meeting, held Tuesday, April 5th and the Columbus meeting held Thursday, April 7th. A LPNNRD Director and resident of Fremont provided one of the introductions at the Fremont meeting, along with Justin Zetterman, the Fremont City Engineer. In Columbus the brief introductions were by a representative of Loup Public Power District and a local resident who is an avid paddler and working on a design for a potential whitewater park. 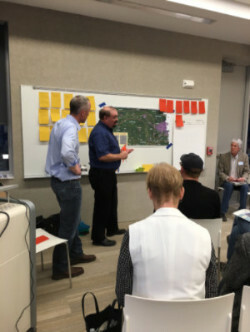 Twenty-six people participated in the meeting in Fremont and twenty people participated in the Columbus meeting.